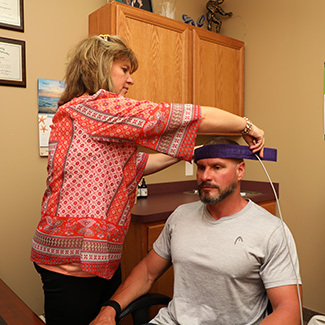 Using NASA science that’s also employed in EKGs, Indigo Biofeedback is a stress-reduction machine and represents the most advanced medical software in the world. Patients will be connected to a device with straps that are hooked around a wrist and ankle; a headband is also worn. The feedback loop from the device puts out an energetic frequency, and the patient responds with a level of stress. The level is fed back to the device and recorded. There are 14,000 signatures that are passed through the patient’s body in four minutes. Dr. Wendy gets a readout of the degree of stress. The device rates the responses from the highest response to the lowest. The lowest response is the most chronic and the highest response is the acutest. From those signatures, she will tailor a patient’s visit to what their complaint is. A lot of times Dr. Wendy will use the Indigo for analysis and do correction on the BAX3000. “What would take me 10-15 visits on my Indigo I can do in 1-2 on the BAX. It’s a beautiful combination,” she says. If you’d like to subtract stress in your life, consider Indigo Biofeedback. Contact Synergy Chiropractic & Holistic Therapy today to book an appointment!